If you look really closely, you can see that it isn’t really 3D (some of objects and transparency are layered in the wrong order) but my goal was to make it use existing plot.network and compute.animation commands as much as possible so that arguments can be reused across the plot techniques. 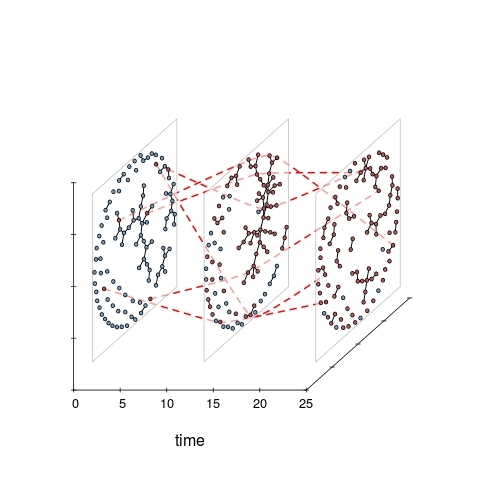 A feature I’m excited about developing further is the transmissionTimeline plot to illustrate a spreading tree from a source vertex in a network (also based on a conversation with Sam). This works to plot the forward-reachable tPath found by the tsna package (or other tree-like edgelists), and will soon be an optional display for exploring infection trees in EpiModel. 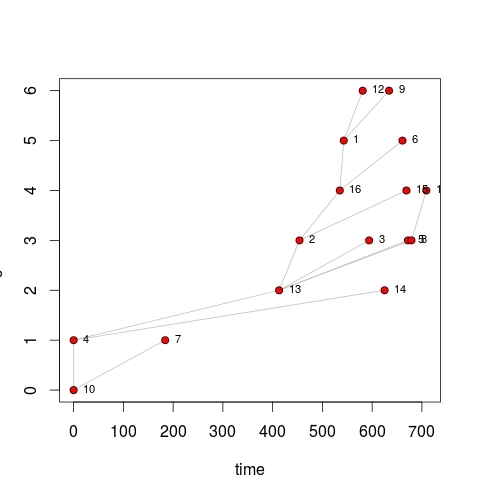 The idea is to show the who-infected-whom tree of relationships by positioning vertices according their infection time (on the horizontal axis) and their transmission generation (on the vertical). This puts the source vertex at the origin (lower left) and all of the infection chains as trails arcing out to the right. Obviously I’ve chosen an example that looks nice, but the technique seems to be surprisingly useful in illustrating bursty-ness and reproduction rates (more on that later I hope). A final feature of note — functional but still preliminary — is the inclusion of some pre-built “special effects” functions for animation rendering. i.e. color edges by their age. See the help page ?effects for details.